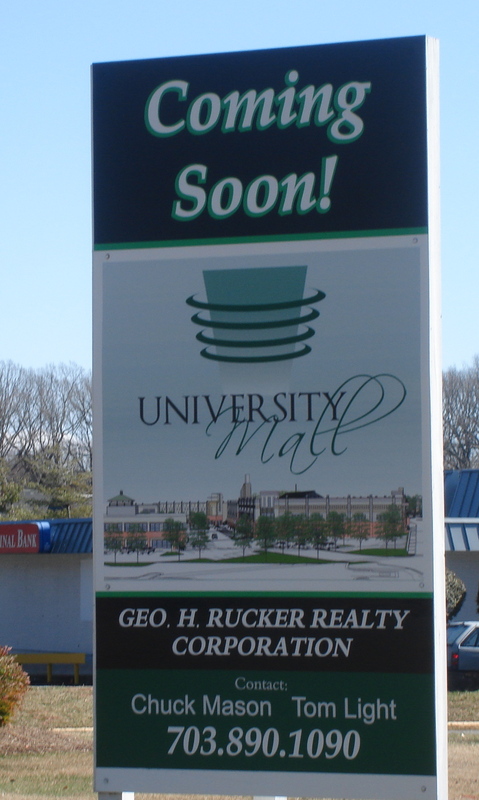 A sign posted at the University Mall along Braddock Road depicts the transformation developers hope to achieve with the renovations. FAIRFAX, April 13, 2013—An official involved with the University Mall renovation says that work has begun on the project, but some patrons are still learning about the planned improvements. “We started this week, actually started construction this week,” said Richard C. Wolff, president of George H. Rucker Realty Corporation, the company overseeing the project. Among those developments is a project that will result in Route 123 going over Braddock Road, Wollf said. “People going straight through won’t have any lights,” he said. Community members have been great during this preparation phase of the project, Wolff said. “Finally, finally, a few weeks ago, everything was approved,” he said and said that crews have begun their work. Still, though, some citizens are just finding out about the changes that are now underway. Justin Nelson, a senior information technology major at Mason, is one of those people. Dontre Johnson, who visited the area recently, was also unaware of the work to come. Wolff said the project will be complete by summer 2014. This story is an update to the article below, which was posted on March 17, 2013. FAIRFAX, March 17, 2013—Patrons of the University Mall on Braddock Road say they hope the upcoming renovations to the complex will protect the atmosphere, the natural environment and their recycling options. Holly Kania and Emily Sawin are students at Robinson Secondary School in Fairfax and visited one of the mall’s breezeway-located eateries one recent afternoon. “I’d kind of be rather upset,” Kania said, referring to the possibility of disruption to the atmosphere of the mall and environmental damage. “I’d kind of feel that’d be destroyed a little bit,” Sawin said, speaking of the peace and quiet she and Kania seek when they come to the mall. “I think the end result will be lovely,” Mark O’Meara, owner of the University Mall Theatres said. While the project has encountered some delays, O’Meara said it will ultimately provide at least some sustainability-related features. “They’re changing the way we take care of our refuse,” O’Meara said. “The county is making [people] run through many, many hoops to comply [with related policies],” he said. O’Meara said that he understands that some people may not believe that transformation is coming to the University Mall. “They’ve been hearing about it for so long,” he said. The project was supposed to begin last May, then last fall, O’Meara said. Still, though, he is confident the end result will be worth it. “You should go online,” he said, referring to a website where developers have posted information about their plans for the project. Chuck Mason, vice president of George H. Rucker Realty Corporation, the company overseeing the project, said the project will cost $34M. Mason said in an email message that the sustainability-related features of the mall post-renovation will go far beyond policies for waste disposal. “Several of the new buildings will be LEED Silver certified,” he said. “The new roofs will be white rather than black. The landscaping will be drought resistant. New HVAC systems will be gas rather than electric,” Mason said as he outlined some of the other improvements. All of these things are in addition to the procedures that workers will follow during the building phase of the project. “Fairfax County requires that the contractor meets sustainability requirements during construction by recycling, etc.,” Mason said. Mason said he is hopeful that construction crews and their work will have no impact on the environment in and around the University Mall property. “We are confident that a new University Mall will have only added benefits to the area,” he said. “Everyone involved with this project has spent years making it the best possible,” he said. Kania and Sawin did not say how they felt about the new facilities the builders will add. They said they were more concerned about the changes the developers will bring that have the potential to interrupt their quiet afternoon visits to the mall. O’Meara, however, said he is sure the finished development will be an asset to the community. “I’ve been here for 22 years,” he said. “I think for the mall, it will be awesome,” he said. Mason did not respond to an email seeking information about when crews might begin renovating the University Mall.